Ten years after 9/11, an unknown natural phenomenon causes North America to sink under the sea. Shortly thereafter all the other continents crumble to bits and disappear beneath the waves, leaving Japan the only dry land on the planet. Before long, all of the world's refugees are crammed onto a few tiny islands. The sudden increase in population, causes food shortages, uncontrollable inflation, massive unemployment and a drastic rise in crime (particularly by displaced foreigners) To control the immigrants, the government bends the Constitution with extralegal measures and organizes the G.A.T. - Gaijin Attack Team. Their mission is to capture and summarily deport the illegal aliens. Three years pass, and the frustration and anger of the foreign refugees is about to explode. 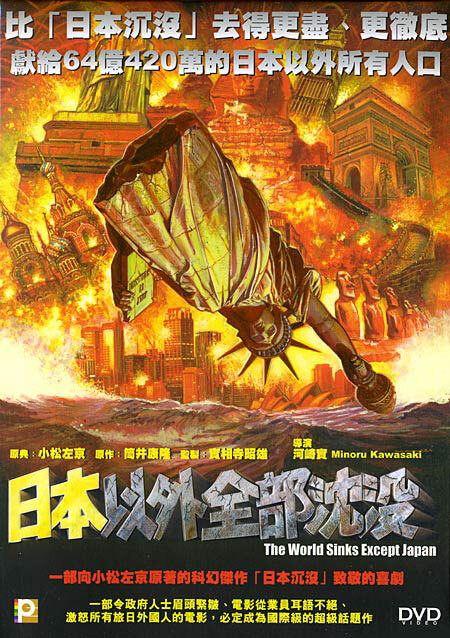 "The World Sinks Except Japan" is a parody of "The Sinking of Japan".